As you know I finished the gold cap challenge in December. After that I have pivoted full scale multi realm flipping. My long term crazy goal is one billion goal, but this is still incredibly far off. I will have to break into cross realm trading to get close to that. I have been doing BoE flipping and pet flipping across 9 realms on EU. For the most part I have focused on BoE flipping and fine tuning my approach across all my realms. I use the general approach I have used since Legion where I search using search strings and compare the price to region market value prices. I also do battle pet flipping, material flipping and I sell of some assorted crafted stuff. I started recording my results in excel back in the beginning of February to make it easier to tell how I’m doing. 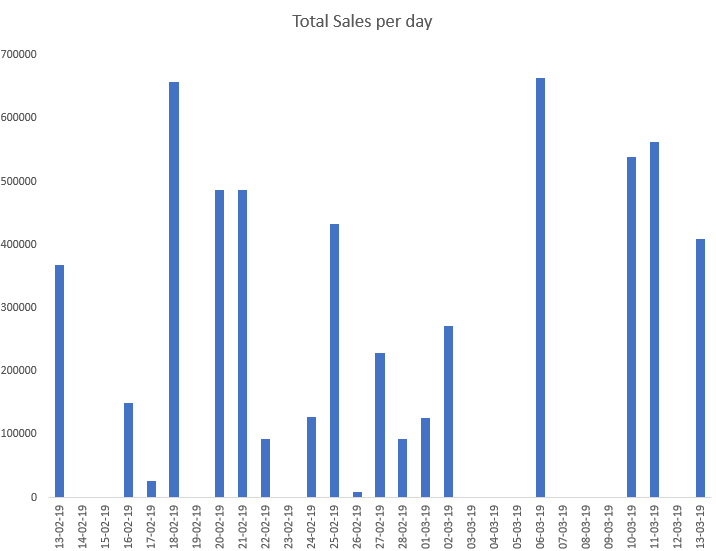 I’ve just recorded the key figures related to my total sales per day, BoE sales and gold spent on BoEs and total gold. 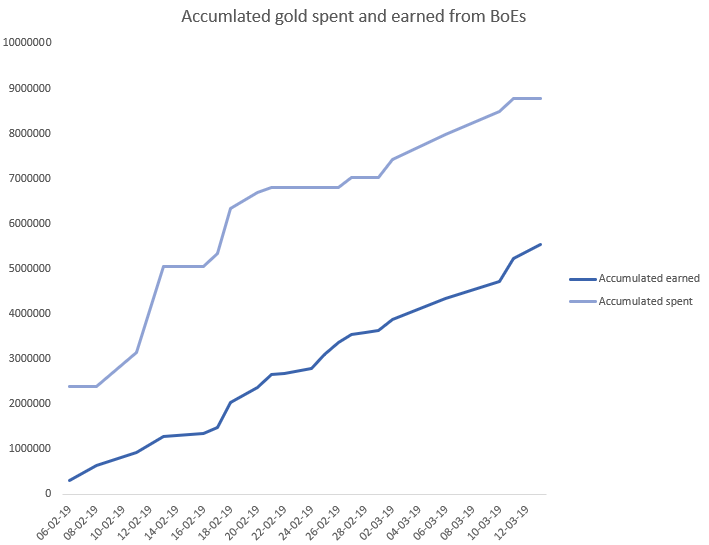 As you can see my gold has dipped down quite quickly as I bought a ton of BoEs. It has started trending slightly upwards again which indicates that the market is stabilizing! I clocked in at 6.6 million gold in total sales from the 6th of February until today. We can see the distribution on the bar graph below. If a date is missing data it means I did not have time to collect mailboxes. We can easily see I am quite inconsistent still. Still 6.6 million gold is very nice and that does equal about 180k on average in sales per day. 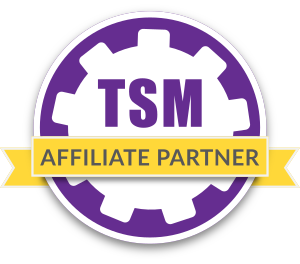 At an average profit margin of 30 % that would mean I make a token about every 4 days on average. Obviously that hasn’t been the case lately though as I have been investing ridiculous amounts into BoEs as we will see. My average sales per realm are shown below. 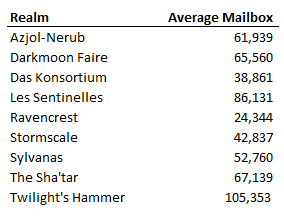 All mailbox sizes are based on the sales from one repost cycle as I do not use cancel scans at all. As we can see my gold cap challenge performs best, probably because I have a decent number of crafted items there in addition to my flipping markets. The BoE market deserves it’s own section. My total spend is 8,782,934 gold and my total sales are 5,531,586 for a total net loss of 3,251,348 gold. 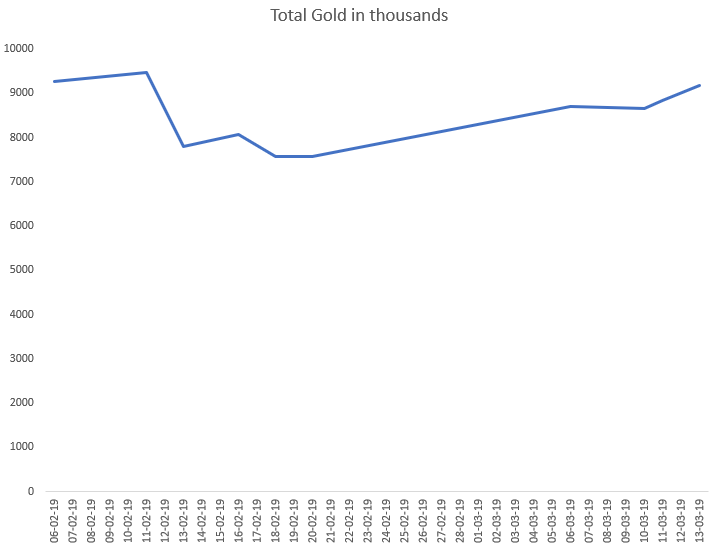 That’s a massive loss, but profitability does seem to be increasing slightly as you can see from the graph of accumulated gold spent and gold earned. The BoE sales represent 83% of my total sales over the period. That seems like a good level considering I really want to focus on BoEs. I am losing gold on BoEs, but they bring in a ton of sales still. Overall I make between 100k and 24k on average every time I repost auctions in terms of sales. 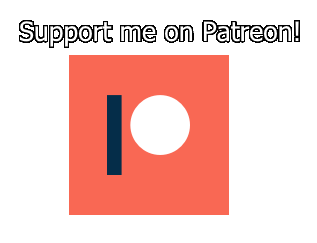 If my long term profit margin holds at about 30% then I should be making a token every 4 days on average!